The First Sunday of Advent begins a new church year, and that means a change in our Sunday morning readings. This Advent we begin Year C, the year of Luke’s Gospel. People often remark about the great difference between John’s Gospel and the other three (Matthew, Mark & Luke, the so-called “synoptic “Gospels), but Luke has a distinctiveness as well. There is so much unique material in Luke, that Christianity would be very different without it. Imagine Christianity without the birth stories of both John and Jesus, and the rich material about Jesus’ mother, Mary, in the first two chapters of Luke’s Gospel. Imagine it also without the great parables of the Good Samaritan (10:29-37), the Prodigal Son, (15:11-32), the Dishonest Manager (16:1-13), and the Rich Man and Lazarus (16:19-31). Then there is the story of the two thieves crucified with Jesus and the post-Easter story of Jesus on the Road to Emmaus (24:13-35). Luke is also distinct in that it was not written to a community and its circumstances, as Matthew, Mark, and John all seem to be. Luke writes to an individual, “Theophilus,” although the name, meaning “friend of God” may be a stand-in for the generic audience to which he writes. If the latter is the case, Luke seems to be written to the community of Christians dispersed throughout the Roman Empire, and part of his agenda seems to be both helping those people find their place in the Empire, and as an apology for the Christian movement to the Empire itself. 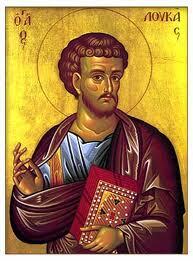 Luke is also distinct because he writes a second volume, which we know as the Acts of the Apostles. Luke is sometimes called the “Gospel of the Holy Spirit,” because the Spirit shows up many times, especially in the first two chapters. The Holy Spirit is mentioned more times in Luke’s Gospel than the other three Gospels combined. Women have a special place in Luke’s Gospel. Both Elizabeth and Mary have major roles in the first two chapters, and then Luke has a habit of telling parallel parables, one with a male and one with a female character. Luke is also the only Gospel writer to speak of the women who followed Jesus and who helped fund his mission (8:1-3). Luke believes that Jesus is the one who interprets the Scriptures for us, from the story of the young Jesus in the Temple (2:41-52) to his “inaugural sermon” (4:14-30) to the Road to Emmaus story. There is a universalism in Luke’s Gospel, certainly more so than the others. Jesus is the savior of the whole world. His emphasis is on the mercy of God, and he downplays the notion of Jesus’ death as a “sacrifice.” Jesus is rather the defeater of death who continues his presence with us in the breaking of the bread. There is longstanding debate as to whether Luke was a Gentile or a Jew. Argument for the latter revolves around his concern that Jesus is the fulfillment of Jewish Scripture, although he quotes the Hebrew Scriptures far less than, say, Matthew. Yet he writes in a kind of universalism that makes one believe he is a Greek. Perhaps he was both, i.e., a “Hellenized Jew,” either a convert or a Jew raised in the diaspora. The Eastern Church holds Luke to be the originator of the icon, although mention of this dates only from the 8th century. Luke does seem to have known Mark’s Gospel and uses it as a source. He also has some content in common with Matthew (from an unknown source often referred to simply as “Q”). Most scholars date the writing of the Gospel to the latter decades of the first century. f. Rest of Easter Year C from John’s Gospel. Note: We read Luke 24:13-35 on 3rd Sun Year A & 24:36-48 on 3rd Sun Year B. Copyright © 2018, Epiphany ESources, www.epiphanyesources.com, 67 E. Main St., Hornell, NY 14843. Permission to copy for congregational use, or to include portions of the above in newsletters or bulletins, so long as this reference remains.